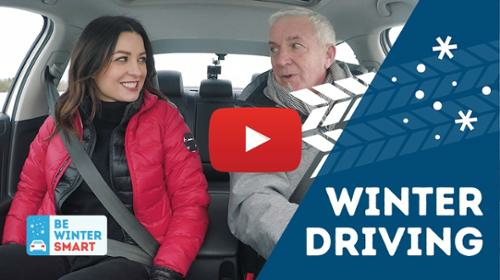 We got behind the wheel with Raptors in-game and digital host, Kat Stefankiewicz, to get up to speed on winter driving habits and techniques that can keep you safer this winter. Kat gets ready to test her winter driving skills on the track. 1. Respect the weather – Winter driving demands that you adjust almost every aspect of your driving behaviour to account for poorer visibility and slippery conditions. This means reducing your speed, putting a lot more distance between yourself and other vehicles and choosing a different route or delaying your trip to avoid getting into trouble in the first place. 2. Know what you’re driving on – Check the road surface constantly. Snow, slush and ice all have different grips, and wet roads can ice up quickly if the temperature drops. Keep extra distance between yourself and other drivers to help prevent collisions. 3. Focus far ahead – Don’t fix your eyes on the action right in front of you but instead look far ahead. This will help you spot upcoming hazards and give you time to plan, while also smoothening out your steering and braking, which helps prevent skids and collisions. 4. Stay smooth and gentle – Slow, smooth movements are key to maintaining control in winter conditions. Braking and accelerating should be as gentle as possible to avoid wheel spin and sliding. Sudden or harsh movements can throw your vehicle into a dangerous slide. 5. Brake early and roll to a stop – You need extra time to react in winter conditions, which can make roads more slippery than you might think. Drive defensively, and keep your distance. 6. If you slide – Stop doing what you were doing (probably braking, turning or accelerating hard). Resist the urge to press the brake pedal harder and crank the steering wheel (the wheels aren’t gripping so this won’t help). Anti-lock brakes will help you retain some steering control. If there is an option to steer to safety, then release the brakes and steer in the direction you are going (into the skid). In slippery conditions, keep a light touch on the wheel, which helps you “feel” your car better and may warn you of an impending skid. Kat puts winter and all-season tires to the test at the Canadian Tire Motorsport Park. As Kat learned from her day on the track, practice and professional instruction can go a long way toward sharpening your skills and building your winter driving confidence. Consider taking a winter driving course so you too can learn potentially life-saving techniques from pros like Kevin. Winter tires can also give you an edge on winter roads, so ask your local tire service professional about options that meet your needs and keep this list of winter tire models available in Canada at your fingertips. Professional driving instructor, Kevin Cronin, explains why winter tires make the perfect travel companion for your winter commute. Read?>>?